The current exhibition in the gallery EIGEN + ART Leipzig provides an overview of the wide-ranging work of the Dresdener artist Karl-Heinz Adler. 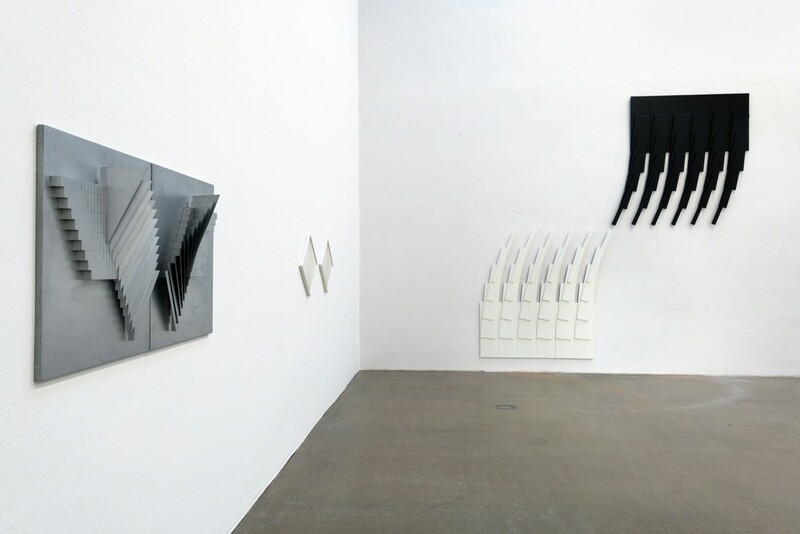 Adler’s works follow a defined system and the concept of the series. Different phases of his work build on each other, and each new series can be seen as an advancement of the previous. 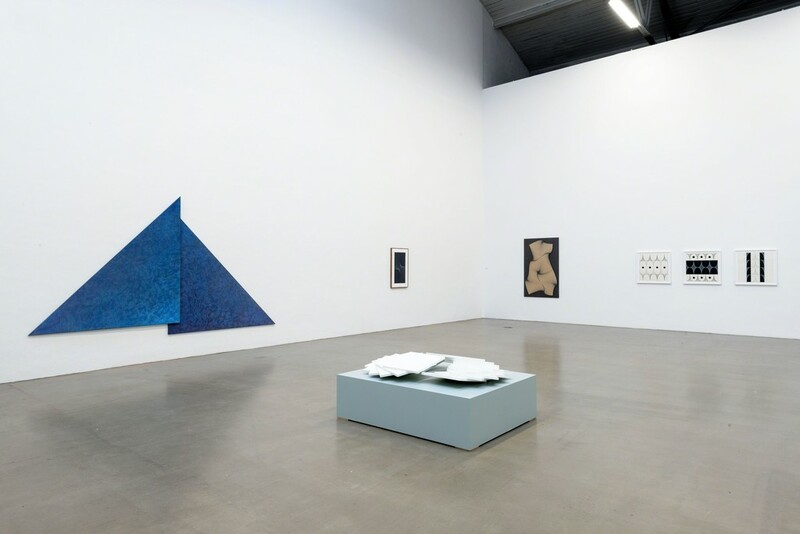 Based on a selection of works from between 1960 and 2017, the exhibition responds to Adler’s creative output and situates it anew in the spaces of the gallery. “Schichtungen” (layerings) and later the “Seriellen Lineaturen” (serial lines) emerged, as well as the first relief-like compositions of surfaces with prefabricated serial construction units of various materials and colours. A basic constellation is played out in a series of variants. This production principle of layering in geometric precision remained a recurring motif also in later series of works with different materials and techniques. In Adler’s delicate glass objects and layerings from the beginning of the sixties, surfaces expand in alluring discrete- poetic nuances of colour saturation. The process of forming, destroying and re-forming from order to chaos and from chaos to order became a persistent theme of Adler’s artistic practice. For instance the always recurring form of the triangle: The triangles shift into one another either in strict formations or they expand into rigorous, symmetrical arrangements. Form and a reduced colour palette – Adler strictly limited himself to two main colours per picture – merge into a precise aesthetical entity. In addition to the layering principle, Adler also continued to constantly advance the basic tenet of seriality further, both in lines and coloured surfaces. With “Serielle Lineaturen” that he developed in the second half of the 1960s, he radicalised the play with the reduced form and the spatial illusion. Viewers are drawn into his illusory pictures. Beginning of the 1990s, Adler began to disassemble square and rectangle canvases to reassemble them following a modular system in ever-changing new combinations. In this process, a “basic idea following various principles of order” is pursued and similar elements are layered onto each other. Adler applied a similar principle for his sculptural objects too. Most of Adler’s object-layerings are reliefs hanging on a wall, which, despite their voluminous forms, never completely move away from panel paintings. 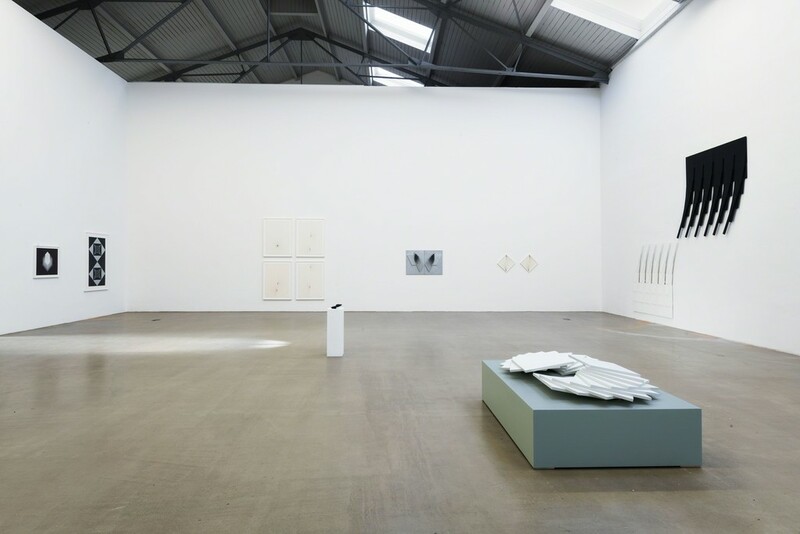 Similarly, other plastic pieces, arranged on the floor of the room following the principle of the series, emerge and yet they transform the defined system and the concept of the series, which lay at the centre of Adler’s works, in the room. The Hungarian artist Imre Bak (*1939 in Budapest) is committed to finding a universal form of expression in his work through which he aspires to unveil the indiscernible aspects of reality. He creates an eclectic visual vocabulary through critical appropriation of folkloric form elements and the modifications of such components in contemporary variations. This, he developed at a time of deep isolation in Hungary with translations of theoretical literature as Samizdat (partly prohibited, self-published literature in the Soviet Union) as well as imported art catalogues, that introduced him to artists such as Frank Stella, Jackson Pollock, and Robert Rauschenberg. In 1960s Hungary, there was a ban on abstract art, which meant the exclusion of such artworks from museums and regular galleries. A cultural policy of “three T’s” was devised to classify artworks: Tiltott, Tűrt, Támogatott (banned, tolerated, supported). To avoid being banned, artists often had to resort to an obscure, muted language that is difficult for us to comprehend today. Bak describes the journey he took through Europe to Paris, London and Venice with his artist colleague István Nádler in 1964-65 as a moment of initiation. This results in recognisable influences of the already established art forms, such as tachisme, minimalism, hard-edge painting and geometrical abstraction in his paintings. In his work line serves to construct his primary interest: space as a phenomenon. Bak thereby opens up connotations to urban landscapes and spatial situations. In this way, he demonstrates that he receives a significant part of his inspiration for his colour and form combinations from postmodern architecture and its theoreticians (Charles Jencks, Memphis Group, Studio Alchimia). However, Bak utilises forms not as mere architectural components, but as distinct ornaments. The politically charged significance underlies Imre Bak’s seemingly non-involved linguistic and visual semiotics. 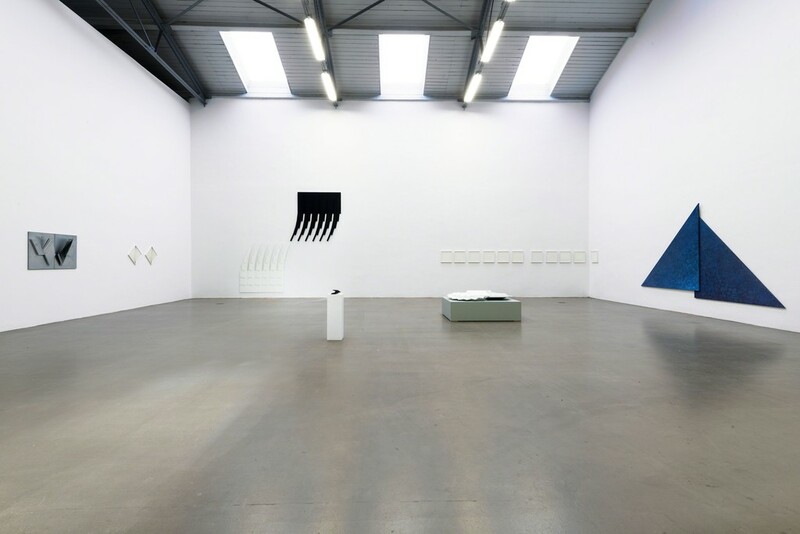 This brings him closer to Karl-Heinz Adler, presented in the main room of the gallery, to whose geometrical formations a notable subversive character can be attributed under the cultural policies of the GDR that were hostile to abstract art. There are various overlappings, intersections, and congruencies between Karl-Heinz Adler and Imre Bak. First encounters happened in the 1970s, however, regarding content, the two artists have been connected since the beginning of their respective careers. Because of his relationship with artists such as István Nádler, Dóra Maurer and also Imre Bak, Karl-Heinz Adler was in contact with the Hungarian art scene. The similar living conditions under a system that rejected abstract art through its repressive cultural policies resulted in contextual and formal analogies. The similarities in the formal language of the two exhibited artists bear witness to a spiritual affinity that has emerged due to external factors. Currently, it is possible to retrace this spiritual affinity in the gallery spaces of EIGEN + ART Leipzig.